This 3-speed tricycle offers freedom and stability for adults of all ages. Perfect for a neighborhood cruise or run to the market. 3SPD / Rider Height: 5'2" - 6'2"
With superb stability, the Raleigh Tristar 3-speed is ready for your next adventure. The 24” wheel in the front and the two 20” rear wheels keep the Tristar 3-speed stable enough to ride around town yet narrow enough to fit through an exterior door for easy storage. Your clothing will stay clean and dry thanks to the front fender and the chain guard. A lock on the front brake makes parking easy. The Raleigh Comfort Tractor Saddle keeps the ride smooth and enjoyable. 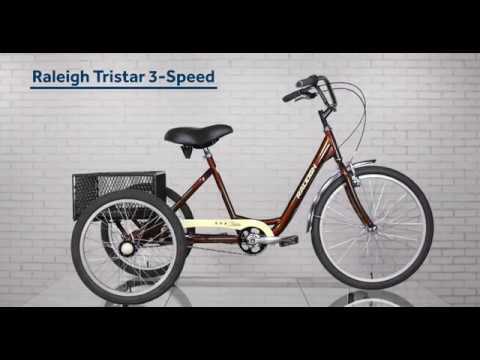 Whether you are taking a spin around the neighborhood, to the grocery store, or to the local park for a picnic, the Tristar 3-speed will get you there in style. I have had an electric trike but it was too fast for me. Saw this second hand and gave it a try. Loved it the minute I got on! Fit me to a tee and is so incredibly easy to ride. Went down to the bike shop and bought a second one for my hubby. Now we both ride for exercise and just plain fun. The Raleigh is incredibly well balanced so you don’t even think about turns. Three speeds are excellent for getting up the slopes in our neighborhood. It’s geared just right and is so much fun running all over our neighborhood. We are in our seventies and feeling the wind in our hair makes us feel like kids again, I cannot say enough positive about this trike! Get one...you will be glad you did!